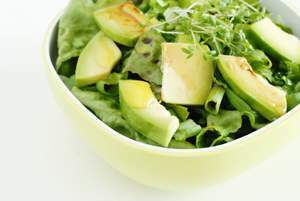 Want to establish new healthy food habits? Finding the glut of healthy eating tips overwhelming? Many people carry an intention to make healthier choices about their diet. Choose your own change and take it one step at a time. Here are three simple healthy eating tips that can start you on the way to healthy changes. Research indicates that establishing a simple repetitive habit takes about 21 days, or 3 weeks, for most people. So let’s say 4 weeks is a safe margin for establishing a new habit. Choose one of the 3 habits listed below and start heading positively in the direction of healthy food habits. The health benefits of green smoothies are enormous, they’re easy to make and taste better than you can imagine. Drinking a fresh green smoothie each day is one of the single most effective changes you can make to improve your diet. Results include glowing skin and eyes, enhanced health, improved digestion, weight loss, better sleep, increased energy and reduced cravings for unhealthy food. 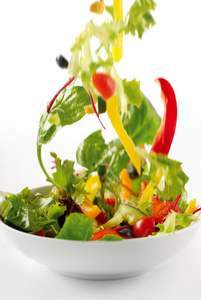 Eating a fresh vegetable salad will provide you with abundant nutrition and balance out your meal. Fill at least half your plate with a delicious and juicy salad. You don’t have to give up the foods on the other half of your plate – yet. Just make sure that you eat up your salad! You’ll feel full, get plenty of fibre and be closer to satisfying your daily requirements for vitamins and minerals. Just in case you haven’t already got around to growing your veggie patch you can get started with a jar in your kitchen. Growing your own sprouts is easy. I’d recommend starting with mung bean sprouts as they’re versatile, taste sweet and good and grow easily. Place half a cup of mung beans in a glass jar and soak them overnight. Use an old stocking or tea towel for the lid of your jar, secured with an elastic band. After approximately 8 hours, rinse and drain your sprouts well. Leave your sprout jar on a bench top out of direct sunlight, upside down at an angle so that the water completely drains. Following their first soak, rinse and drain your sprouts 3 times a day until they have small tails of 5-10mm. This takes about 2-3 days. Fresh is best. 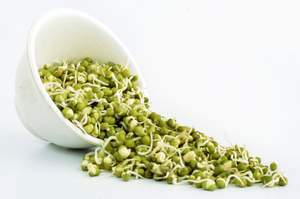 Mung bean sprouts are high in protein, iron, fibre, vitamins C, K and B6, riboflavin, folate, copper, manganese, thiamin, niacin, pantothenic acid, magnesium, phosphorus and potassium. Use them in salads or smoothies and enjoy the buzz of extra health.